Even if I wasn't a fan of Green Zone, a film that suffered for coming out so soon after The Hurt Locker, then I still have to concede that even watching a less-than-excellent Paul Greengrass film is still better than, say, not watching a Paul Greengrass film. 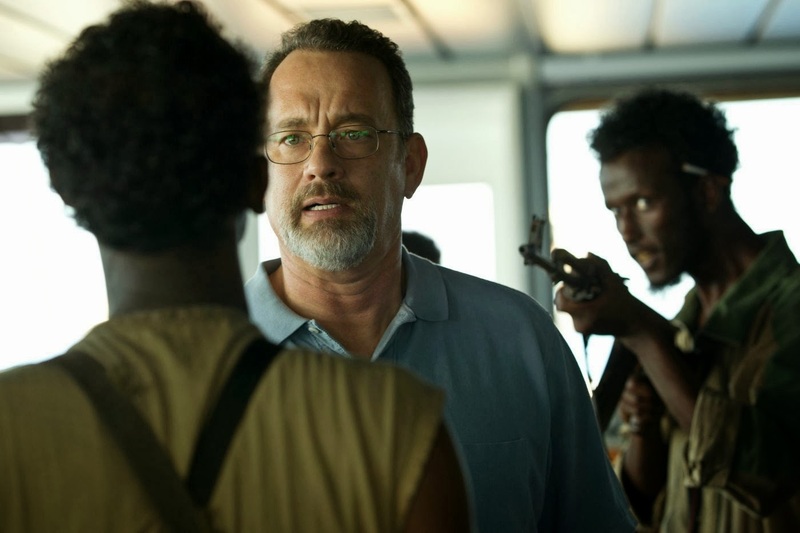 In Captain Phillips, he works with Tom Hanks, and that makes him nigh-on unstoppable. Based on the book by Richard Phillips and Stephen Tafty, "A Captain's Duty: Somali Pirates, Navy SEALS, and Dangerous Days at Sea", this is Hanks and Greengrass telling the story of the 2009 hijacking of the Maersk Alabama freighter, and the hostage crisis that ensued. Phillips is a family man who begrudgingly took his ship around the perilous Horn of Africa, when a group of impoverished Somali fishermen attacked and took over. The ordeal that followed found Phillips fighting for the lives of his crew, and then fighting for his own. It shouldn't be too hard to figure out whether or not the captain makes it out of this story alive, but it's shockingly easy to forget about that while you're actually watching the film. Greengrass has a well-honed knack for suspense, and Captain Phillips almost plays like a thesis film that shows the product of the experience he gained on the Bourne films. The tension never lets up, until it finally gives way to a hugely affecting release, which leaves the viewer feeling a little like they've emotionally shat themselves. In a good way, of course. It's very much a film of two halves. The first, in which the pirates pursue and ultimately hijack the freighter, is a slow-burner, but a terrific start. Phillips' ingenuity in staving off the inevitable boarding is particularly fun to watch, and if the real Phillips was half as cool under pressure as Hanks' performance of him is here, then kudos to him. Throughout the film, Hanks plays it outwardly cool, but with a believable undercurrent of horror in his demeanour. In the second half, the film both tightens and slackens its focus on his central character. Once he's shoved into the claustrophobic environment of a tiny lifeboat with the four pirates, the film moves away from the crew of the Maersk Alabama and leaves Phillips as the sole protagonist. At the same time, we see more of the rescue operation, moving away from the more contained setting that provides so many thrills earlier in the film. The stakes keep rising steeply, so it's not like the film becomes weaker from there on, but it does feel like something of a sea change. Given how the audience probably knows the story from when it was news, if not from the book on which the film is based, this could have been a pretty clear cut story. But it's to the credit of Billy Ray's script that it tries, at least some of the time, to round out the pirates as characters too. 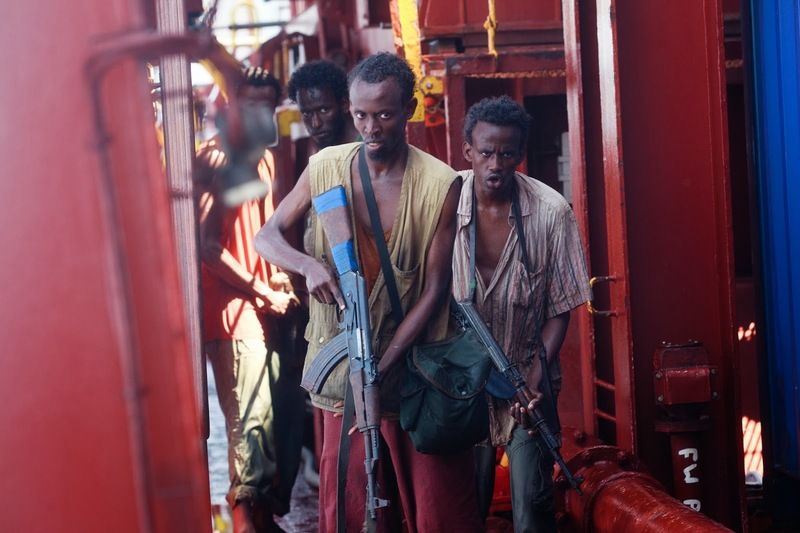 Barkhad Abdi gives an attention-grabbing turn as Muse, who also has the most depth of the pirates, but the others are too often given over to screaming orders at each other and at Phillips, and don't have many characteristics outside of their role in the team. An opening monologue by Phillips, about how kids have to work harder to survive than he had to in his day, doesn't so much chime, as clunk with the abject poverty that drives the Somalis to piracy. But it does still serve to underline the fear that runs throughout the film. It's full of characters doing things they don't want to do in order to survive, and even if the less experienced actors don't quite measure up to the towering lead performance, Greengrass makes sure that the fear is palpable and contagious throughout. On the surface of it, Captain Phillips could have been another rote, simplistic "incredible true story" only a few years after the fact, pitting America's loveable older brother against some caricatured, yammering foreigners. With Paul Greengrass at the helm, it's a far smarter and more exciting film, which features some nail-biting action, and genuinely boasts some of the best work of Tom Hanks' career. Nothing speaks better to Hanks' enduring everyman quality, or to the quality of the film and his performance in it, than the fact that it reduces us to a nervous wreck around the exact same time as his cool facade finally shatters. Captain Phillips is now showing in cinemas nationwide. 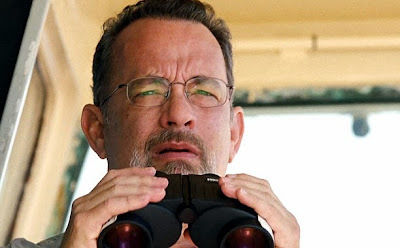 If you've seen Captain Phillips, why not share your comments below? Has anyone else tried to describe the "Tom Hanks and pirates" movie to someone, and then watched them gradually stop smiling when they realise it's quite a serious story? That's Hanks-power. VERY LOOSLEY based on the book by Richard Phillips and Stephen Tafty, "A Captain's Duty: Somali Pirates, Navy SEALS, and Dangerous Days at Sea". The real Capt wasn't well liked, and is being sued by his crew.